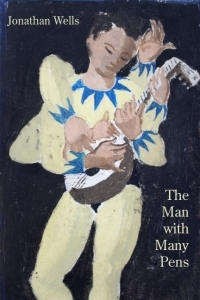 The Man with Many Pens is about love—“a love that smells so much like blood”—and song—“a song that the oak leaves will not finish.” These poems examine how a single love or a single song contains multiple personalities and contradictory forces, tensions and concordances. Beneath those poems such as “The Man with Many Pens,” “The Six-Armed Musician” and others that display the multiple complex emotions of love, there is a more naked, personal narrative. when heat snuffs night's blue candle. on the beach is the wind's body. and the screech itself is dawn. "Each poem carries its own loss without melancholy. (Good Night) '…My metal fingers/ drifted toward her who’d slept/ beside me until the final frame.' And there’s a poem of sharp brilliance not equaled since Stanley Kunitz wrote of his father’s picture in 'Self-Portrait' '…She ripped it into shreds without a single word and slapped me hard. I/ in my sixty-fourth year can feel my cheek still burning.'" Read the full review.